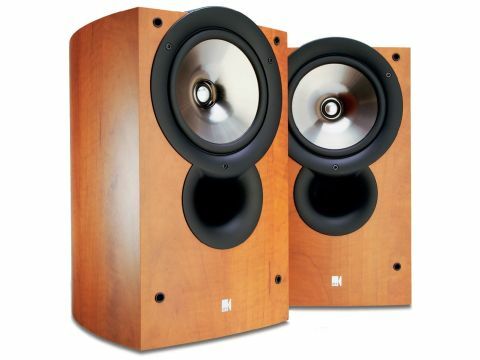 Its latest near-budget iQ-series was originally launched in mid-2005, replacing the 2002 Q-series, and we actually reviewed this £280 per pair iQ3 alongside its big iQ9 brother a while back. The iQ3 is the larger of two iQ standmounts, and is based on a solitary 165mm Uni-Q drive unit - an exclusive KEF coaxial design - to handle the bass, midrange and treble. The enclosure features beautifully curved and tapered sides, which not only look very attractive, but should also improve overall stiffness, and avoid the focusing of internal lateral standing waves that rectilinear boxes tend to create. This shape is echoed in a very gently curved front panel. The speakers are available in a choice of maple, walnut, dark apple or black ash vinyl woodprint, plus silver finishes, and are further decorated by a moulded black 'bump' that covers much of the top surface, matching the curve of the Uni-Q driver frame. Much of the difference between the old Q-series and the new iQs lies in improved drive units. The latest Uni-Q drivers now feature die-cast frames, stiffer, titanium-coated 115mm plastic cones, longer throw suspensions, copper-plated flat aluminium wire voice coils and elliptical-profile tweeter domes. The unique Uni-Q feature is that a small 19mm tweeter is mounted on top of the pole-piece that protrudes from the middle of the bass/mid driver cone, and is actually located at its 'acoustic centre'. This makes it very easy to accomplish a smooth crossover transition, and also ensures that the transitions are as smooth off-axis as they are on-axis, so the far-field power response should be smooth, too. The iQ3's solitary 165mm Uni-Q driver is reflex-loaded by a large, flared front port, and equipped with twin terminal pairs connected together by wire links if bi-wiring is not adopted. Optional port-blocking foam bungs are supplied - probably useful if the speakers are placed close to a wall. Best kept well clear of walls, although the supplied bungs could be useful if individual conditions dictate close-to-wall siting, the iQ3 delivers a good overall sound balance, with an attractive warmth and fair dynamic expression, though its character isn't the smoothest or sweetest around. The midband is slightly obvious, bringing good projection to voices, yet at the same time the presence zone is sufficiently restrained to avoid undue exaggeration of sibilants or consonants. One obvious bonus with the Uni-Q driver's coaxial tweeter is that the sound remains relatively consistent whatever the listening axis, and there's none of the 'lobeing' that can afflict vertical head movements with conventional speakers. Another Uni-Q feature is that high frequency dispersion is a little restricted, which sharpens up stereo image focus and precision, at some expense in terms of the 'musicians in the room' impression. There is just a touch of 'hollow' coloration here, and the bottom end might have been capable of a little more weight and authority, but percussion and bass lines are clean and clear, though the top end does lack a little sweetness. But cabinet coloration as such is clearly very low and the dynamic range usefully wide, giving good analysis throughout the bass region. On balance, the iQ3 is a thoroughly attractive all-rounder, with a shape that's both functional and pleasing to the eye, and at a price that's very nice. The iQ3 comfortably meets the manufacturer's specified 89dB sensitivity rating alongside an undemanding amp load, which falls to around five ohms at the port-tuned frequency of 48Hz, then around 150-300Hz, and again above 10kHz, but which stays above six ohms elsewhere. The overall frequency balance looks well judged, giving decent output level down to 40Hz when the speakers are mounted on open stands clear of walls. The far-field in-room averaged frequency response looks particularly impressive above 300Hz: virtually flat from 300Hz up to 2.2kHz, and gently downtilted thereafter, though there is some unevenness around the crossover region, between 2.2kHz and 4kHz, which might account for the slight lack of treble sweetness. Below 300Hz the averaged balance looks well enough judged, but also far from smooth, showing a series of /-5dB peaks and troughs through the bass and lower midband.